If you’re looking for a newcomer’s take on Monster Hunter, you’ve come to the right place. While I have some familiarity with the Capcom franchise, I was one of the many who spent little time actually playing the games before being intrigued by Monster Hunter: World, the first same-day worldwide release for the series. So if you’re like me, someone who is wondering what exactly Monster Hunter has to offer, I’m happy to tell you that Monster Hunter: World is an absolute delight and something that can be enjoyed by any player. That being said, it is a deep and challenging experience. It takes patience and a desire to learn the inner-workings. Even beyond that, with some elements being poorly explained, it might require you to find wikis, forums, or helping hands. Monster Hunter: World, while not being impenetrable, certainly isn’t going to make things easy for you. But as you start to learn the systems and the overarching mechanics that form of a loop of gameplay where you explore, battle, fail, succeed, craft, and improve, the game becomes addictively rewarding and deeply fascinating. You kick off by creating a character, with gender and appearance options to customize. Monster Hunter is a game that invites player expression in many ways and the character design screen is an example of that as you can carefully craft the facial features of your protagonist. The unique part of this character creation is that after you’re done building your character, you also get to create a feline companion called a Palico. These sentient cats, that walk on two legs, have their own customizable features like fur color and patterns - and it’s fun to play with the various styles for your companion. After you’re done building your character, you’re introduced to the game’s narrative - such as it is. You have left the Old World, presumably where the previous Monster Hunter games were set, to explore the New World. Fleets of ships have been crossing the ocean between the two worlds, carrying hunters and their support teams in order to help establish a base in the New World to study this new ecosystem. Furthermore, the Elder Dragons have been crossing the ocean to the New World, however their motives for doing so are unknown. As you reach the end of your journey across the ocean, your ship is attacked by the elder dragon, Zorah Magdaros. This colossal monster knocks you off the ship and you wash up on shore, finding your way to the human base of Astera, where you begin your work as a Monster Hunter. And “work” is the optimal word. While the plot is used to provide context and meaning to your quests, for the most part, your character almost feels more like an exterminator than a protagonist. The game stops occasionally to drop little narrative mysteries here and there, which pay off pretty well - the reason for the elder dragons’ crossing is particularly interesting. There are also some ruminations about wildlife and its ability to thrive in strange locations, but largely the game focuses your day-to-day routine as an elite member of a field team whose 9-5 workday is all about tracking and killing massive monsters. The world Capcom has built for these monsters is a huge part of what makes the game such a success. While I personally could have used a few more environments, the areas built are used to tremendous effect. There’s a familiarity that one acquires as they revisit the same locations over and over again, but these locations never get dull because the game constantly finds new ways to use the environments, keeping them fresh. Sometimes that means changing the kinds of monsters you’ll find, other times that means blocking off large chunks of the level until the game wants you to get there. It’s a wonderful use of space that allows you to never feel overwhelmed by Monster Hunter: World, yet constantly feeling like you can find something new. The art is visually pleasing; little details like hanging vines and strange coral formations make the New World a beautiful place. While the areas aren’t overly large, there’s been a lot of work to make them feel endless through the vistas and skybox employed by the art team. The game also uses color in subtle but creative ways to draw distinction between the areas. The lush green of the Ancient Forest is strikingly different to the golden browns of the Wildspire Wastes. This extends beyond the settings to the characters. The true cast of the game are the monsters who come in a variety of sizes - each with their own unique strengths and weaknesses. There are nimble and vicious hellhound-like monsters, dragon-esque monsters that spew fire, monsters that resemble birds or dinosaurs, and monsters that swim through mud. They each have unique blend of colors and visual aesthetics to not only make them look different, but to tip players off to their attacks. After you’ve killed these monsters you can carve them up and use their materials to make armor that also is a joy to look at. 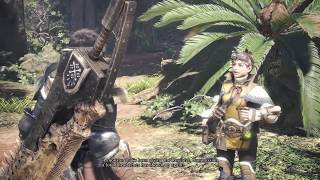 Instead of spending experience to upgrade stats, character progression in Monster Hunter: World is based on the continuous crafting of armor and upgrading of weapons that improves your defense and attack. And this process wouldn’t be nearly as much fun if the style of the armor didn’t vary so wildly. With dozens of armor sets, it’s fun to collect pieces of armor and see how badass your character can look. You can spend hours farming one monster to craft every piece of armor, making a complete set, or you can mix and match as you progress through the game. The game also sounds amazing. 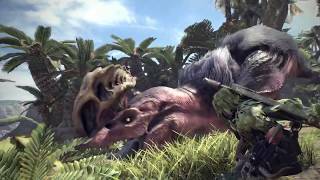 Each hunt begins with a quiet serenity, whether it’s the sounds of endemic life in the forests or winds whipping through the highlands. Then, once you find the monster you’re looking for, they each have their own distinct roars and snarls. The scale of a fight is wonderfully communicated as monsters crush rock formations or create holes that lead to underground burrows. Meanwhile the music highlights the battle with resounding epic horn arrangements on top of tense string sections. The way the game seamlessly transitions from one atmosphere to another is incredible. That’s important because there are a lot of transitions in Monster Hunter: World. Every time you boot up the game, you’ll begin in Astera, where you’ll do your crafting of armor and aides. There are a lot of tools at your disposal in this human colony. You’ll be able to visit your house, where you can access the training grounds, and keep little pets that you capture out in the New World. You can combine the items you find during your hunt into useful potions to help when you’re in danger. You can visit the smithy and craft new armor and weapons. You can talk to the researchers who can grow the plants you need or help you with researching certain monsters. There’s also an opportunity to talk to characters and pick up side quests. There are actually a few different kinds of quests in the game. Assigned quests are the story missions, which usually have you killing monsters. Optional quests are side quests picked up around the base. Investigations are quests that ask you to hunt or capture a monster for study, or sometimes force you to slay multiple monsters within the allotted time frame. There are also Expeditions which are more about exploring the world, and Deliveries, which are your typical fetch-quests. It’s not a ton of variety, but really the quests themselves aren’t the focus - again, this is all loose context for why you’re fighting monsters. Once you’ve got yourself fully equipped, it’s time to head out. The game has an annoying amount of loading screens, and while they aren’t eternal, they certainly take long enough to be bothersome. You’ll usually begin the quest at camp which acts as one of the few spawn points on the map. As you make your way out into the wilderness, it’s impressive to see how much work Capcom has put into building the ecosystem of Monster Hunter: World. You’ll see lesser monsters that are herbivores, grazing out in the open, who’ll largely ignore you unless you attack them. 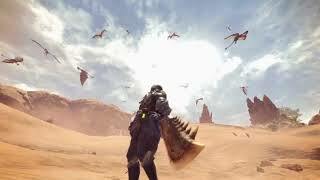 There’s also endemic life such as birds, insects, and small mammals that spend their time running and hiding from you, occasionally venturing out to graze by the herbivores. There are the pack hunters, who swarm around their prey, but usually are simply scavengers. Lastly, there are the monsters you’re actually hunting. What’s impressive is how these different life forms all work together. While hunting the Great Jagras, I first saw it leap from a hiding place and swallow up an herbivore monster whole. When I attacked it, its pack came to its aid. If two predators end up in the same location, they start fighting each other - each trying to protect its hunting ground. It creates a feeling of reality to this world. You can see how monsters behave and witness the food chain at work. Each monster attacks with different patterns, and has its own weaknesses. There are monsters that will burn you, monsters that will stun you, monsters that will poison, and monsters that will bleed you dry. The confrontations are slow affairs that require you to learn the patterns and tells for the movements of each monster, reacting quickly. The fights are also determined by the kind of weapon you’re using. Monster Hunter: World features an assortment of weapons that allow you to cater the game to your style of play. You might use something like a long sword or heavy melee weapon, blocking to avoid taking damage. You can use the dual blades to quickly maneuver around the creature, and deliver fast blows. You could use a bow and attack from distance, breaking off pieces of its body to weaken it. Again, this is another method of player expression and choice, leaving it up to you to find the best way to hunt. There is almost always a fifty minute limit to complete the story quests and you’ll need a lot of that time. The fastest story quests will usually take about twenty minutes, but some of the tougher monsters will take nearly the full time. You’ll also only have three continues, meaning you’ll only be able to lose all your health and “faint” three times. As the monsters become more wounded, they’ll become enraged and become more unpredictable and dangerous. So while you can gamble a bit more when first fighting the monster at first, the latter stages of the fight call for a more conservative approach. This can change and vary hunt to hunt, and that’s part of what makes these fights so much fun. Reward is the key word because it defines the feeling that you’re flooded with after these battles. The long and arduous process of fighting these monsters can be trying and frustrating, especially if you’re stuck on a difficult monster, but it feels so good to lay these beasts to rest. It’s been a long time since I’ve had a game leave me feeling this good and this proud about being able to complete quests. If you’re having trouble slaying a monster, you can team up with others. The game does scale a bit in the multiplayer, so it’s not always easier, yet it can help if you’re feeling your play style is working against you. The issue with teaming up is that if you have a team of three or four, you’ll lose your Palico, which not only distracts the monster, but can also bring you healing items in crucial moments, allowing you to save your potions. Also, when playing with others, you can only faint three times between all of the players in the quest. The majority of the time I spent with the multiplayer was a really great experience. It’s nice to see how the different weapons types not only work well on their own, but also work well together. Getting the opportunity to have the monster focus on a tankier character that could block damage, allowed me and my dual blades to slide under the monster and do major damage. Or seeing ranged weapons do damage from afar and distract the monster allows melee character the opportunity to be more aggressive. It also maintains the intensity and need for caution when fighting, but allows you to consider your strategy in a different way. It’s really awesome how all of these different facets of the game come together to make for a constantly engaging experience. Each of these systems layer on top of each other, from the monster behaviors to the way you prepare for a hunt, to make Monster Hunter: World feel like a complete package. But what’s best is how all of this is understated as just part of the Monster Hunter job. The game has a workmanlike quality that makes all of these features feel almost incidental, just natural part of the world. Clearly, I’m pretty in love with this game, but it does have its flaws. There are some technical hiccups, the kinds of bugs that you would expect with larger semi-open world games. Your tracking system might not pick up monster tracks until you’re standing right on top of them, the controls betray you and instead of jumping to safety, you belly flop on the ground. There are also the technical issues you’d expect of a multiplayer game that’s almost constantly online. There’s no way to pause the game, which means if you’re on the hunt, there are no breaks. The monsters sometimes freeze in the middle of a fight as the game lags. Still, in my 60 hours with Monster Hunter: World, I only encountered these technical issues about ten times - not great, but not the worst. The controls are also a little stiff and take some getting used to. Part of this feels like a feature of Monster Hunter, refusing to make itself too easy on the player. In order to achieve a more fluid movement during combat, players will have to practice and find a weapon that works for them. This also true of some features that the game doesn’t really explain that well to you, or that are stuffed into tutorials that overload you with information. Again, due to a herculean effort from the community you can most likely find any question you have answered online - but it’s still a knock against the game that such comprehensive additional research can be required. But I’m nitpicking a bit here, as none of those complaints really turned me off from Monster Hunter: World. Overall, I think the game is an absolute triumph. There are shortcomings, but Capcom succeeds in all of the places where they’ve clearly put in the work. The living world is phenomenal, the hunts are intense and rewarding, the overarching loop of gameplay that encourages progression through more hunts and more crafting is addictive. It might not be for everyone with its required patience and desire to learn, but once it gets its hooks into you, you’re in for an incredible experience. So if you’ve been waiting to give Monster Hunter a try, now is the moment. Jump into Monster Hunter: World and find out what makes this series so good for yourself. Monster Hunter: World look and sounds amazing. Capcom has clearly put a ton of time and effort into building a beautiful world to explore that is constantly surprising. The narrative isn’t anything to write home about and there’s a lot of investment into each hunt, but it pays dividends as the reward for success is intoxicating. While there are differences, the feel of the game remains the same. The epic fights retain their wonderful scale even with others. With a game this big, running online, there’s the expected amount of technical hiccups, just enough to be annoying. Monster Hunter: World is a fantastic game that kept me enthralled for 60 wonderful hours. I loved exploring the world, discovering new areas, and engaging in epic fights with excellently designed monsters. There's so much gameplay to enjoy, that despite a few snags, I’d wholeheartedly recommend it to almost anyone.